Want to catch more bass with finesse baits? Take a cue from ballroom dancers and enhance your moves with an eye-catching skirt. Dress up your favorite finesse worm with a VMC® Neko Skirt. VMC’s new Neko Skirt comprises living rubber and silicone, creating a unique action underwater at all water temps, “especially as its puffing out,” Iaconelli says. Epoxy resin anchors it within the end of a custom-modified VMC Neko Weight. Conical ribs on the spike-shaped weight anchor it within your favorite finesse worm, without damaging it. A Neko Skirt is easy to use. Simply insert the weight to which its attached into the end of your favorite soft-bait (choose the thicker end if you’re fishing an asymetric worm). 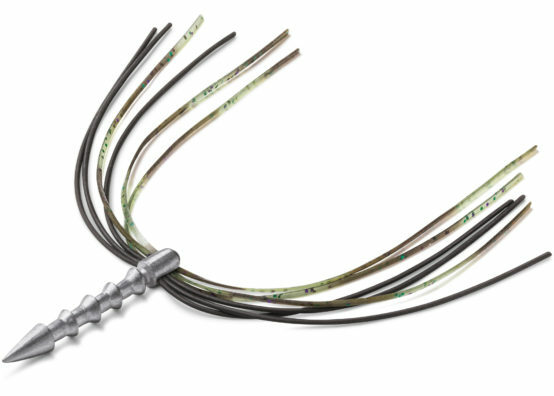 It can enhance the action of Neko Rig, wacky worm and shaky-head worm, just to name a few. Iaconelli suggests leaving a little of the weight sticking out of the worm’s end. “That way when it’s pecking on the bottom as you shake it, you get that noise, but it also allows that skirt to breathe, to puff out,” he explains. Bites come often while pausing between shakes, as the skirt billows. Neko Skirts are available in eight bass-attracting color patterns: Black Blue, Chartreuse Illusion, Peanut Butter Jelly, Pumpkinseed Orange, Shad, Baby Bass, Sprayed Grass and Watermelon Red. They come two per-pack with four weight sizes: 1/32 oz, 1/16 oz, 3/32 oz and 1/8 oz. But don’t think those small sizes means Neko Skirts attract only small bass. “They catch giants too!” Iaconelli says. This entry was posted in Rapala, VMC. Bookmark the permalink.